Anthony Quackenbush is a Fort Lauderdale Parking Lot/Parking Garage Slip and Fall Accident Lawyer who helps to get catastrophically injured clients the compensation they deserve. 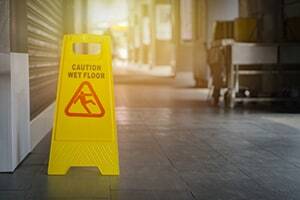 Unfortunately, slip & fall accidents happen in parking lots and parking garages every day. They may occur for any number of reasons. For example, water or other liquids left on the ground/floor of parking lots and garages may cause slip and fall accidents. Debris or other objects left on the floor/ground may likewise cause trip and fall accidents. If this occurs and you are hurt as a result, you will need to prove that the owner of the parking lot or parking garage had notice of the dangerous condition (i.e., knew about it or should have known about it) in order to obtain compensation. After all, if the owner had no notice of it (for example, if water was spilled on the ground/floor of the parking lot or garage only seconds before your fall), then there is no way that the owner of the parking lot or garage could have been responsible. On the other hand, if the owner knew of (or should have known of) the dangerous condition, then it will be held responsible for it. Parking bumpers or parking stops also frequently cause trip & fall accidents in parking lots and garages. This can easily occur, for example, if a parking bumper or parking stop is out of place. A person walking through the parking garage or parking lot in that situation might not notice the parking bumper or parking stop and might trip over it as a result, causing injuries. It is the responsibility of the owner of the parking lot or parking garage to make sure the property is kept in a safe condition. If the owner doesn’t do so (e.g., leaves parking bumpers or parking stops out of place), then the owner will be liable for any injuries that result. If you’ve been hurt in a parking lot or parking garage anywhere in Florida (including Miami, Miami-Dade County, Palm Beach County and West Palm Beach), contact Mr. Quackenbush as soon as possible. You can receive compensation with the help of this Fort Lauderdale Parking Lot/Parking Garage Law Firm. Call Mr. Quackenbush at 954-448-7288. Parking lot and parking garage slip and fall accidents may also result due to inadequate, improper, or poor lighting - or lack of lighting. Parking lots, for example, typically have lights illuminating the ground. However, these lights may not be working or may not be adequate to light the area. If this occurs, a person walking through the parking lot at night might trip over objects that he or she can’t see. If this occurs, then that person could potentially pursue a case against the owner of the parking lot or parking garage where the trip and fall accident occurred. Again, a property owner has a duty to keep his or her property safe. If the property owner doesn’t do so, then he or she will be responsible. Many parking lots and parking garages have surveillance cameras. If you fall and are injured in a parking garage or parking lot, it will be important to attempt to retrieve the footage/video from such cameras. After all, such footage could potentially reveal and prove the cause of your fall. However, if there were surveillance cameras in the parking lot or parking garage where you fell, it will be important to retrieve the footage as quickly as possible. After all, many such surveillance systems are on “loops.” This means that these video cameras tape over themselves every so often (every three days, every 10 days, every 30 days, etc.). Once the video cameras tape over themselves, the footage will be forever gone. As such, it’s important to retrieve the footage as soon as possible. In this situation, in order to ensure that the video footage isn’t disposed of or altered, Mr. Quackenbush may send a letter called a “preservation letter” instructing the owner of the parking lot or parking garage not to get rid of or alter the footage in any way. If the owner does so after receiving the letter, there can be severe penalties in Court. If you’ve been hurt in a parking lot or parking garage due to a dangerous condition anywhere in Florida, it will be important to determine the owner of the parking garage or parking lot. Ultimately, the owner of the property will be responsible for your injuries. In addition, it will be important to determine if there was any maintenance company responsible for the upkeep of the property. That is, sometimes owners of parking lots or parking garages will hire maintenance or cleaning companies to clean their properties. If the maintenance company doesn’t do an adequate job and leaves a dangerous condition on the property which injures you, then the maintenance company will be responsible. Even if this is the case though, the property owner itself will also still be responsible. This is because the property owner is said to have a “non-delegable duty” to keep his or her property safe. That is, the property owner may be able to hire another contractor to clean its property and do general upkeep, but the property owner can never “contract-away” its duty to keep the property safe. Call 954-448-7288 to speak to Mr. Quackenbush if you’ve been hurt anywhere in Broward County. This includes Coconut Creek, Cooper City, Coral Springs, Dania Beach, Davie, Deerfield Beach, Hallandale Beach, Hollywood, Lauderdale-by-the-Sea, Lauderdale Lakes, Lauderhill, Lighthouse Point, Margate, Miramar, North Lauderdale, Oakland Park, Parkland, Pembroke Pines, Plantation, Pompano Beach, Southwest Ranches, Sunrise, Tamarac, West Park, Weston and Wilton Manors.